This Pinup Photo was added on Wednesday 18 September, 2013. A tribute to the US Air Force's 66th birthday on September 18, 2013! Splitting from the US Army, the US Army Air Force became the US Air Force and officially it's own branch of the military in 1947. 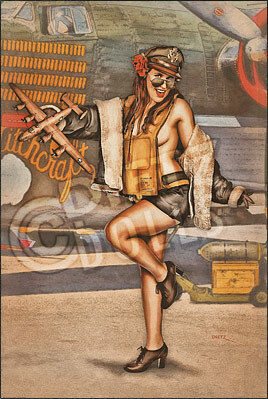 Captain Shea here, a B-24 Liberator Pilot, has just returned from a bombing mission over Germany. Demonstrating with a B-24 model the maneuvers required to evade the heavy flak, she's happy to be back on the ground at the base in England after the long flight. Happy Birthday Air Force!